Prestige Green Star 17" Jumping Saddle, medium gulllet. 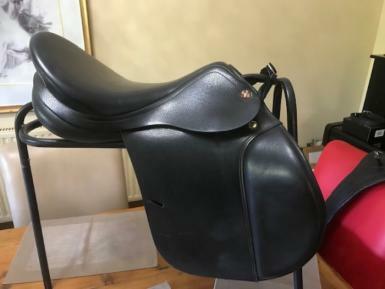 This comfortable saddle is in excellent condition and has been covered and conditioned regularly. The leather is of superb quality that does not mark or wear easily. Girth points are in excellent condition and there are no scratches or marks. I have loved owning this saddle but as I have just sold my warmblood/thoroughbred this saddle does not fit my young horse. Option to buy Tekna jumping girth (120cm), Tekna flex jumping stirrups, black Dollegiate stirrup leathers and Flexi Fit Amanda Ross Eventing 5 point breastplate (full).